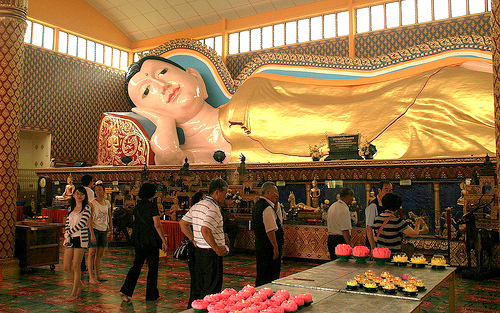 The Reclining Buddha Temple (Wat Chayamangkalaram) is located at Burma Road (Lorong Burma), Pulau Tikus, Georgetown, Penang, Malaysia. The temple can be seen on the road from Georgetown to Batu Feringghi. It is located right across of the Dharmikarama Burmese Temple. 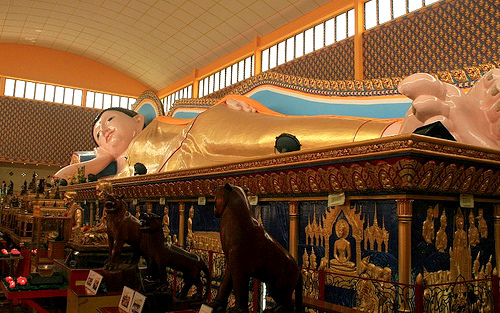 The Reclining Buddha Temple (Wat Chayamangkalaram) is also known as the Sleeping Buddha by the locals. 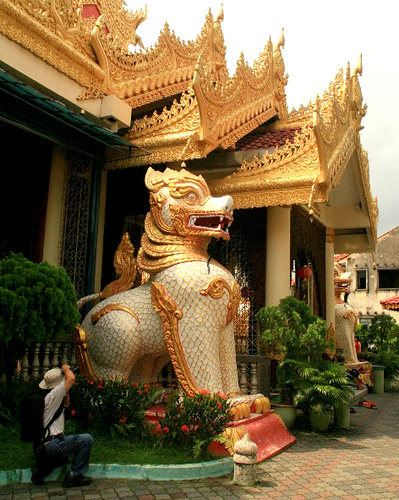 This temple is a Thai temple and it is well known due to the gold plated reclining Buddha that is as long as 33meters. This made it one of the largest available in the whole wide world. 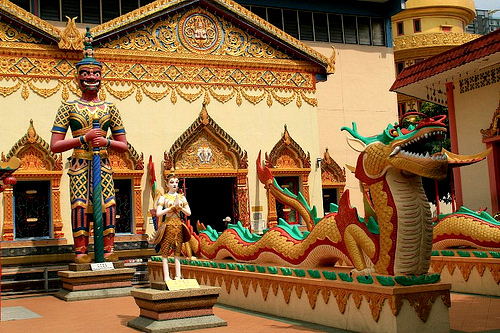 The temple was built in the year of 1845 on the five acres land given by Queen Victoria to the Thai's community. The reclining Buddha represents the historical Buddha at his death, with the name of Pra Buddhachaiya Mongkul which is a symbol to a complete peace and detachment from the world. 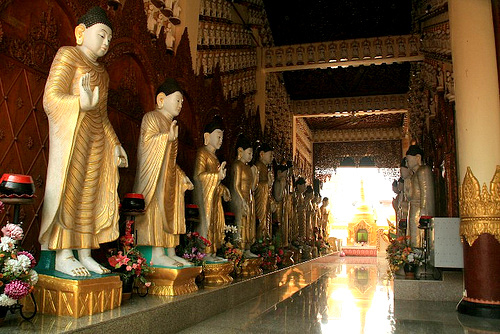 You will be greeted by two statues right outside of the temple entrance. Remember to take off your shoes when you step into the temple. Behind the reclining Buddha, you can see there are many niches, containing the ashes of devotees. There is a small Thai village and a Thai cemetery just behind the temple. Hotels in Penang are in a wide range from budget motel to 5 star hotels. There are luxurious yet affordable hotels in Gurney (Persiaran Gurney). Most tourists plan a stay there as it is the centre spot of Penang. The famous shopping mall which sell high-end brands - Gurney Plaza is situated just a few steps away. The well known Gurney drive which offers tantalizing local food is nearby too. In the next few years, Gurney Paragon will be up and open to public. Gurney Paragon includes a shopping mall, an office tower and residential towers. Take the Rapid Penang Bus numbered 101 from Georgetown. You can catch this bus from Chulia street, which then goes to Komtar and then along the famous street - Jalan Burma. The temple is on your right hand side. There are other buses that run near to the temple with numbers 10, 103 and 104. You can also take a cab to the temple from anywhere in Penang. 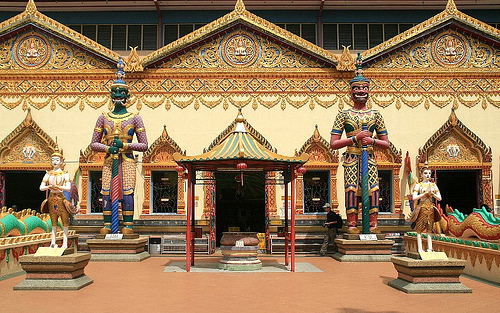 The ride will cost an negotiable amount of RM40 form Georgetown to the Reclining Buddha Temple.